Please read, enjoy this book and pass it on. Share the love of reading! Thank you very much, liamhliom, for making this book available in the EU fiction VBB. I have had a copy of this book myself, but then decided not to read it & I sent it out. Now, some time later, I find myself being interested in this book, so I thought I'd request it from the VBB. Look forward to read it and find out if I like it or not! "In the turbulent and mysterious Barcelona of the 1920s, David Martin, a young novelist obsessed with a forbidden love, receives an offer from an enigmatic publisher to write a book like no other before—a book for which "people will live and die." In return, he is promised a fortune and, perhaps, much more. Once again, the author of The Shadow of the Wind takes us into the gothic universe of the Cemetery of Forgotten Books and creates a breathtaking adventure of intrigue, romance, and tragedy, and a dizzingly constructed labyrinth of secrets where the magic of books, passion, and friendship blend into a masterful story." Mysterious, interesting, strange. To be honest, I have no idea whatvto think of it. I liked the story, that's for sure. But to comment on questions like 'who is the boss'? Or 'did Martín make it all up? ', 'is history repeating itself?' and many, many more, for that is is all way too muddy. So instead of analyzing, I just end my short note by saying I had a wonderful time reading this book. This one will be going north as well. To be read by travelina, or just to be put aside for the convention: either is good with me. This book is travelling to Norway, to travelina, with many other companions. For travelina to read (if she's interested and has the time), otherwise to be released at the convention in Oslo, where it hopefully will find a new reader. Thank you so much for sending the books, Boekentrol! A book for the book buffet at the BookCrossing Convention in Oslo. Picked from book table at the convention. I've read The Shadow of the wind by this author and found it a most fascinating story. I'm looking forward to read this book as well. I'm not quite sure what to say about this book. When I read The shadow of the wind I found it mysterious and enchanting. 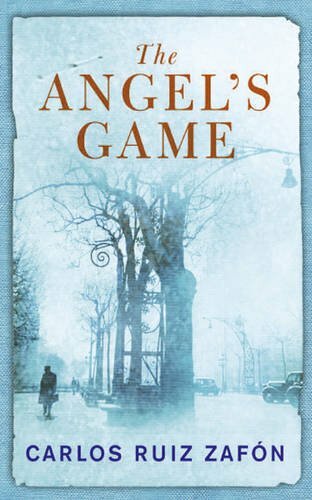 It's rarely a good idea to compare books, and yet I find myself doing so comparing the two Ruiz Zafon books I've read and finding The Angels game not really measuring up. If at some later point I'm suddenly overcome by some ingenious thought I just have to express I'll edit this JE, but for the time being this is all I manage to squeeze out.